I'm not sure without Panopticon I'd have gotten into black metal. Oh, it was a genre I was exploring, but it was mostly at arm's length, tentatively probing into alien walls of screaming guitars, hammering drums and howled vocals, and while the huge melodies were appealing in the more atmospheric material, I was waiting for that special record to really click. And then came Panopticon, blending in elements of bluegrass and folk and country, genres I knew well, and with records like Kentucky served as my bridge into a genre that captured the primal character of Appalachians, both at its most abandoned and wild to the mountains ravaged by the coal industry and desperate poverty. Yeah, even though I've always found the lyrics from Panopticon nearly impossible to make out - and project mastermind Austin Lunn has no interest in making them easy - there was something to his guttural roars that painted a stark picture to pull me back again and again, culminating when he released Autumn Eternal and it made my year-end list for the best records of 2015. So, three years later... and we have a two-hour double album, half of which was atmospheric black metal, the other half country folk with an ambitious breadth of instrumentation that almost seemed to imply a more progressive side coming through with this band. And with that album title, it was hard to avoid the thought that Austin Lunn might be returning to the more stark political subtext that hammered through Kentucky. And while I knew this was going to be a LOT to fully take in... hell, I was on-board, so what did I find on The Scars Of Man On The Once Nameless Wilderness (I and II)? I'll be honest: I struggled with this record more than I thought I would - and no, not just because of the length, although that sure as hell didn't help. No, the more listens I gave to this Panopticon record the more perplexed I felt, because while there are definitely atmospheric black metal songs on this project, they're only one component to a piece that spans acoustic folk, country rock, progressive metal and even spoken word thrown into a ponderous but wildly textured and intense release... and I wish I could say it's one of the best of the year, but I'm not sure I can. And in a change of pace, it's not the black metal that's throwing me here, because for as ambitious as this project can feel, I often found myself wishing there was a lot more of those tones in comparison to the other digressions this album explored. So let's start with the compositions and production, shall we? 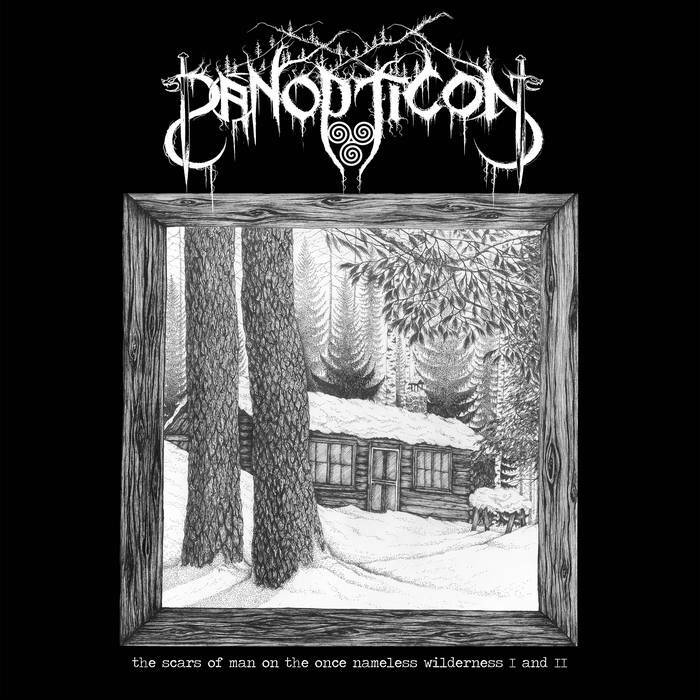 As was described, the first half of this record does trend towards more atmospheric black metal while the second half is country folk, but there is a fair amount of overlap - the first disk contains more acoustic interludes and folk-inspired pieces than you might expect whereas the second does have some moments where the crunch of electric guitars roars in. Not quite the fusion of tones that Austin Lunn damn near perfected on his last few full-length records and there are definitely some clunky transitions between songs, but there's a shaggy, organic feel to the composition where the more progressive digressions not only feel grounded with a certain primordial texture, but melodically sound as well. And while I could go on at length how the blast-beat drumwork is flat out bonkers and capable of playing to more twisted progressions, or how damn well the production dynamics allow the tones to surface to bring real ragged texture, especially in the acoustic guitar, mandolin and banjo but also ebb back into the huge, primal roar of sound, what consistently wins me over is the usage of strings arrangements. Maybe it's a personal weakness of mine, but not since some of Dave Cobb's best moments have I heard the violins placed so damn effectively - courtesy of Johan Becker, they hit truly striking moments on songs like the final minutes of 'En Hvit Ravns Dod' or 'A Ridge Where The Tall Pines Once Stood' and especially 'A Cross Abandoned' and '(Cowering) At The Foot Of The Mountain'. Just the poise, the ragged texture, how damn well they can capture the aching, windswept melancholy of this album has a pure raw beauty I can't praise highly enough. And there are so many of those stunning instrumental moments: the aggressive bounce of the main electric guitar line on 'Blatimen', the acoustic solo of 'The Wandering Ghost', how well this record transitions from the thunderous black metal riffs of the first disc to the smoky country rock tones of the second - in both cases often showing tremolo shredding - and in the latter case leading to some crescendos that take all the time they need to earn their dramatic payoff, and that's before we get the complex time signature shifts of a song like 'En Generell Avsky'. Now I won't say it all connects - I do wish the accordion could have been better blended into the melodic foundation, some of the melodies can start to lose their presence in the heavier mix of 'The Singing Wilderness', and some of the bluegrass picking can feel intentionally a little rough around the edges, but the melodies and Austin Lunn's almost primordial grasp of melody manages to find ways to create tunes of immense wistful sadness and melancholy - or on songs like 'Sheep In Wolves Clothing' a genuine sense of menace and dread. And that's where, for a change, we're going to be talking about the songwriting and lyrics, because with the choice to embrace more tones in folk and country, the vocal message of these songs is more audible than it has ever been - and wow, what might have been barely heard but subconsciously understood on previous releases has now entered the text and subtext, and Austin Lunn isn't afraid to get political. And yeah, that was true as early as Kentucky and I've always had a real fondness for Lunn's hard brand of conscious environmentalism and appreciation of feral beauty and accepting humanity's frail limitations within the uncaring wilderness, but then you get songs like 'The Wandering Ghost' and 'Four Walls Of Bone', highlighting the dehumanization and spiritual drain of the city with blunt words that do not spare himself. Hell, the final song of the record 'The Devil Walked The Woods' is a particularly grim bluegrass track showing the devil striding through a wilderness ravaged by industry... only to end the record looking in the mirror with the devil revealed as Lunn himself, representative of humanity's culpability at large and the moral turmoil that darkens the entire record. But again, none of that seemed out of character or unexpected - what threw me was 'The Itch', an acoustic folk protest song complete with blasts of harmonica that is about as direct of an anti-Trump song I've heard in the past few years. And while it certainly fits within the record - you can't imagine someone with Lunn's worldview and conscience surrounding the environment ever approving of the current administration - it's where we have to talk about the actual lyrical construction. Don't get me wrong, the imagery is definitely potent... the actual structure of these songs do leave something to be desired, as some of the lines don't have the same sense of flow or cadence so many of the melodies do. And that actually takes me to the biggest criticism of this record: a lot of Austin Lunn's vocals, which again are not so much bad but inconsistent. On the black metal side he's fine - mostly because his howls are placed midway back in the mix - and when he gives himself a richer choir of backing singers for the smoother moments on songs like 'A Ridge Where The Tall Pines Once Stood' and especially '(Cowering) At The Foot Of The Mountain', the harmonies are pretty impressive. But then you get songs like 'The Moss Beneath The Stone' where the harmonies feel a little shakier, or songs where the melodic baritone is pretty solid but can't quite hold the tone when he's trying to belt or show more fiery presence, like on 'Not Much Will Change When I'm Gone'. And to some extent I can't blame him - at some points he's singing at the very bottom of his register and capturing a heavier presence can be tough in that range, but what it reminds me more of is trying to hit the tricky balance between vocal texture and raspiness against a full-throated note, and considering Lunn is no Chris Stapleton or Cody Jinks, there are definitely points where it feels a little forced or thin. But as a whole, more than ever Panopticon has a very distinct niche and crossover audience between atmospheric and progressive black metal and the rootsier tones of country, folk and bluegrass, and more than ever this behemoth of a release is aiming to serve both - and when you couple it with some of his most political content to date, that will be a tough sell. And with all of that in mind, I still think the synthesis of genres was executed a little better on records like Kentucky and Autumn Eternal, and while this is one of the few cases where there's enough here to justify a double album, especially with the downer ending it can make for a draining listen. And yet even with all of that, there are too many transcendent melodic moments for me to not call it great, the sort of powerfully organic, damn near primal music that even though I'm very much a city guy speaks to the side of me that always yearns to vanish deep into the Rockies a few times a year, a spirit I think deep down we can all stand to feed a little more. So for me, solid 8/10, definitely a recommendation, and while it's certainly not everyone, there's a part of me that thinks more than ever it should be, so definitely check this out!